Nice review, Don. Interesting that only one of the five translations you quote is 5-7-5. Indeed, I don't think Hamill is slavish about that syllable count, although his translations do tend to be longer than most other translators. Thanks so much, Michael. As you point out Sam is not slavish on his syllable count - the majority here seem to fall in the 16 to 17 syllable category (admittedly a small sample, indeed) indicating, I think, a dedication to fully getting the sense right, without too much or too little. Looking back over this fine collection entire, it would seem the vast majority are in the 16 to 17 syllable category, so you are right, Sam's translations tend to be longer. His introduction talks about the form in depth and is well worth the read for those who haven't had a chance. 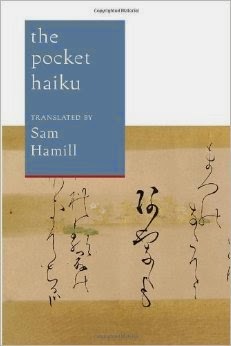 As always, this is a topic haiku aficionados never seem to tire of, including myself, of course. Content over form seems to me to be the best rule, with deep respect to the form as an integral part of the process. One of the beautiful review articles recently I have read. The essence of haiku lies in the diligence of fragrance of flower, simplicity of flow of river, spread of leaves with gentleness of the trees, calmness of clouds and reflection of soothing of shadow. Nature is supreme.The cited examples of haiku evolve around aesthetic supremacy of expression.Thank you Don for your endeavour.